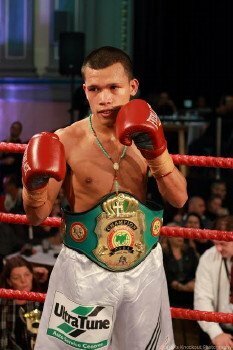 WBA interim world light flyweight champion Randy “Ultratune” Petalcorin (22-1-1, 17 KOs) will defend his title against China’s Ma Yi Ming (12-5, 7 KOs) (WBA #9, WBO #8, IBF #10) on April 24 in Beijing, China at the 18,000+ capacity Capital Gym. The bout will feature on the Top Rank – SECA Fist of Power 3 co-promotion and be broadcast live on free to air television in China. “l am lucky that I had the support of CEO Ultratune Sean Buckley to have Randy fight at Malvern Town Hall in Melbourne, Australia in November 2013 and March 2014, it was a buzz for the local boxing industry to see a potential superstar like Randy fight at the Malvern Town Hall” Maniatis said. Maniatis believes “Top Rank is by far the most successful boxing promotional company in the world, the events in Macau at the Venetian and also live free to air TV Fist of Power events with SECA Group in mainland China have put Asian boxing on the World map. Anyone who has dealt with Top Rank will tell you its first class they treat you like family – from living legend promoter Bob Arum to Hall of Fame matchmaker Bruce Trampler and the international boxing guru and engine room Sean Gibbons and Brad Goodman, who are all great boxing people. Australian boxing has already benefited as we worked to get Steve Attard and Andrew Robinson on the Manny Pacquiao vs Chris Algieri world title undercard in Macau late last year. Also on the Randy Petalcorin – Ma Yi Ming card on April 24, Maniatis has organised another Australian boxer on the card in former Victorian Light heavyweight champion Dane Campbell who will face Chinese boxer Qu Peng. Previous boxing news: April 2 Edition Of LA Fight Club Delivers!